WARNING: For a Proper installation of cork tiles, You must Use roll-on CONTACT CEMENT application. Do NOT use DAP “Non – Flammable” Contact Cement with Forna products, Multiple Forna floors have already failed! Cork tiles can NOT be installed over old flooring! It is important to follow iCork Floor directions regarding “liquids”. The material provided by Loba is for “general” use and does not specifically pertain to use with Forna Flooring Products. Failure to follow iCork Floor procedures will result in voiding the manufacturer’s warranty. Cartons should be left open, in the space during the 48-72 hours of acclimation. DO NOT remove cork tiles from the packages. The day of the installation, packages can be opened and their contents “shuffled” around the room to achieve a pleasing effect. Once the packages are opened, the cork tiles should be laid within 1-2 days. A minimal amount of curling of the cork tiles is expected, especially if the cork tiles have been removed from their packages too early. DO NOT ATTEMPT TO INSTALL cork tiles that have a severe curl. Contact iCork Floor immediately if you feel the product is defective in any way. Make sure the subfloor material is level. Any cement surface that you install a glue-down tile floor on must be above grade. The cork adhesive, Wakol D3540 Cork Adhesive, like all water based contact cement adhesives, is sensitive to ground or alkali salts that can be present in most cement pads. Any salts surfacing through the pad will deposit themselves onto the underside of the cork tiles and cause the cork to lift. Surfaces to be tiled must be sound, clean and dry. All concrete substrates must be tested for moisture – even if they are at or above grade. Moisture content should be below 3lbs. per 1, 000 sq-ft area over 24 hours. Surface alkalinity must be below pH 10. Moisture remediation must be completed before application of cork tiles. Concrete flooring must incorporate damp-proof membranes. New cement must be allowed to dry out fully before the cork tiles can be laid. The recommended time is 1mm/day (1 inch/ month), with adequate ventilation, up to 50mm pad thickness. The rule of thumb is 60 days for the cement pad to dry. Cement pads that are thicker then 50mm take much longer to dry. Cold or wet weather slows the drying process. Always allow extra time for these circumstances. Cork glue down tiles can NOT be installed over old flooring. The installer MUST remove ALL old flooring. Sanding is required when working with old adhesives or paints that are attached to the existing subfloor. Do not attempt to glue directly to chip board or OSB board. Do not attempt to glue directly to chip board or OSB board. Luan board is not considered an acceptable substrate for flooring. Do not fix directly on to asphalt. Do not attempt to glue directly to chip board or OSB board. Luan board is not considered an acceptable substrate for flooring. Do not fix directly on to asphalt. Once the floor is installed you must finish the floor with 2 coats of Loba 2K Supra AT The factory finish cannot be refinished with solvent based varnishes as this will cause delamination of your floor (the polyurethane will bubble and peal; the veneer will delaminate from the cork pad). Using chalk lines and carpenter’s square, find the center of the room by “snapping” quadrants. The center of the floor is the starting point. Lay out the cork tiles (dry lay) as it will be installed on the floor. Adjust the cork tiles until you are pleased with the layout. Use the chalk line to mark every 3rd or 4th row. The chalk lines will guide you during installing cork tiles. Apply adhesive with short nap painter’s roller (3/8” microfiber) to the back of the cork tiles and to the first quadrant on your floor. Start at the wall and move towards the center of the room. Allow the glue to “flash” or dry. Drying takes 45 – 60 minutes depending on room conditions. Wakol D3540 dries clear and shiny. Once the subfloor and the cork tiles have reached this stage, the application (placing the cork tiles) can begin. Starting at the chalk-line and moving towards the wall/outer perimeter of the room, begin laying the first row of cork tiles. Set the cork tiles into place on the floor using your chalk lines as a guide. Press the cork tiles tightly together. Hit the cork tiles firmly with a rubber mallet to set into place. Continue setting rows of cork tiles until you have installed all of the uncut cork glue down tiles. Keep a lightly damp cloth (water) nearby to wipe away any extra adhesive that may find its way onto the finished side of the tile. 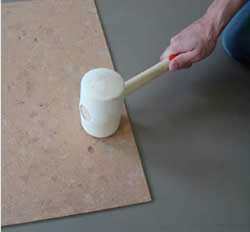 Gently wipe away excess adhesive as you lay the glue down cork tiles. Mark along the back of the tiles where they need to be cut. Slice the tile with a sharp utility knife and remove the unwanted portion of the tile (remove the cut-out). Press the cut tile in place on the floor. Allow the glue to set. Installing cork tiles the rest of the room/space following steps 1-4. Vacuum the floors to remove all small particles. Clean and remove all traces of excess adhesive and other marks using a clean, lightly damp cloth (water). Light use of the floor (1 person in stocking feet) is allowed after installing cork tiles. The adhesive must cure for 24 hours before the first coat of polyurethane can be applied to the floor. Prior to applying Loba polyurethane the factory finish must be lightly abraded (by hand; no machines). This can be done using a high grit sand paper (100 grit or higher) to wipe the surface of the cork floor (like wiping a child’s face). Loba 2K Supra AT is a two-part product. It’s mixing ratio is 10:1 (polyurethane: hardner ratio). For full instructions visit the Loba 2K Supra AT instructions. Pour a small amount of the polyurethane onto the floor beginning at the wall or farthest point of the floor. The amount should be the thickness of a bead of toothpaste and about 2-3 ft in length. 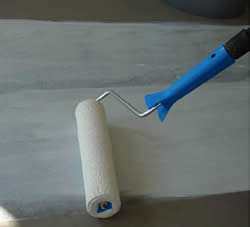 Roll the Loba water-based polyurethane onto the cork glue down tiles with the 3/8” microfiber roller. Roll in one direction. Wait for the first coat to dry (6-12 hours depending on product purchased) before applying the next coat. Apply a maximum of 2 coats per day. This process seals the tile joints against possible water and dirt penetration. It also allows the floor to react as a single sheet of cork rather than individual tiles. After 24 hours the floor is available for light use – one person in stocking feet for 5 minutes at a time. Do not install furniture, area rugs, pet beds, floor length drapery or any soft material over the floor until the polyurethane reaches its full cure (5-10 days depending on product and room conditions). Do not wear shoes nor allow pets or children access to the floor until the floor has reached its final cure. The floor is still vulnerable to indentations that could become permanently imbedded into the polyurethane. If this happens, there is no cure – it is permanent! First “damp” cleaning is allowed after the finish has been allowed to cure for 14 days. Applying damp products to the floor prior to this can cause hazing of the finish that may be permanent. You need only to sweep or vacuum your floor to remove surface grit and dust. A polyurethane sealed floor only needs to be wiped with a damp cloth or mop (water). Be aware that some footwear, such as stiletto heels, can cause indentations in the cork. Appropriate Cleaning Products: water, “pH Neutral hardwood floor cleaner”, water:vinegar (10:1 solution). A cork floor requires “refreshing” every 3-7 years; depending on traffic levels and personal taste. A light buff or “screening” of the floor will remove any residue left over from cleaning products as well as provide a prepared surface ready to take the new coat of water based polyurethane.